German with English subtitles. 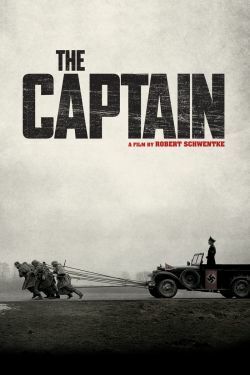 Based on an arresting true story, THE CAPTAIN follows a German army deserter as he conforms to the evils of Nazism after putting on an abandoned captain’s uniform during the final weeks of World War II. Based on an arresting true story, THE CAPTAIN follows a German army deserter after he finds an abandoned Nazi captain’s uniform in the final weeks of World War II. Emboldened by the authority the uniform grants him, he amasses a band of stragglers who cede to his command despite the suspicions of some. Citing direct orders from the Fuhrer himself, he soon takes command of a camp holding German soldiers accused of desertion and begins to dispense harsh justice.